I invested a decent chunk of money into whole life insurance last year because of the product’s reputation for being safe and stable. When I was first approached about investing in whole life insurance, I was confused. My brain couldn’t separate the idea between what I understood of what “life insurance” was (you pay premiums so your loved ones get money when you die) and life insurance as a financial investment. So my agent courted me; trying to convince me that whole life was a smart financial move. I’m not one to throw money away and I generally make sound decisions, so it was quite a long process to get me to 1) understand everything about whole life insurance and 2) convince me that it was a good investment. After a few months of reluctantly meeting with my agent and exchanging dozens of emails, printouts, projections and other details vetting the product, I finally felt comfortable enough to invest. Even with the expensive agent fees, no cash value in the first year, and the product being a longer term play than I preferred, I liked that my money would start stacking after 6-7 years. I’m not a finance guy nor am I an insurance guy, but I know money pretty well. I don’t know every in and out of the product, but I believe I have a decent grasp of how whole life insurance works… in a nutshell. If you invest into whole life insurance, you pay a premium every year – your premium (and whether you are even qualified) is determined by your age and health. Your premium minus fees are placed into a cash value account. How much you can make from your whole life policy depends on your premium amount and the amount of value in your account. As long as you have money in the product, you’re guaranteed an annual dividend that grows tax-deferred as long as there’s cash in the account. So, whole life insurance is very much like buying common stock from a company that pays out dividends… but without the fluctuations and risks of the stock market and company performance. With a whole life account, you can also withdraw the cash value tax-free, though you should pay attention to the rules and guidelines. Also, let’s not forget that this is still life insurance, so there’s the actual death benefit. Does Whole Life Insurance Make Sense for You? If you’re risk-adverse and have money hanging around then it’s a consideration. Of course, you can make more money on stocks and mutual funds, but you can also lose all of your money too. 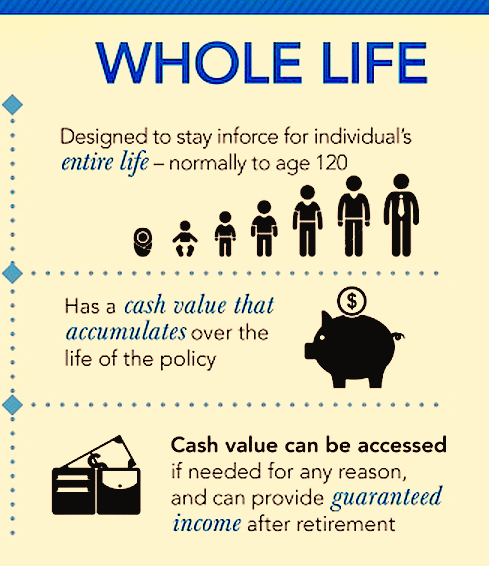 Remember, whole life insurance has a locked-in rate of return (fluctuates from year to year). The policies can make sense for people who need insurance and have maxed out contributions to 401(k)s and other tax-advantaged plans, advisers say. And consider whether you can keep up with the premiums as they’re not cheap. We’re not talking $500 a year, but more like $5,000 (or more) a year. Once you’re locked into your premium, you must be able to keep up the payments. If you can, you’ll have yourself a nice savings account after a few years. As they say, it takes money to make money.